Waking up in the morning can be tough, especially before the sun rises outside. In the wintertime, it can become increasingly difficult to push aside the warm bed comforter as it gets colder and colder in your house. Also, waking up to a blaring alarm clock in total darkness can put your body in a state of "fight-or-flight", where adrenaline is secreted in great amounts in response to the sudden unexpected sound. #FirstWorldProblems, anyone? This alone gave me enough incentive to find a way to create an artificial sunrise to wake me up in the morning. In the past few years, the Internet of Things has been gaining popularity and expanding its reach to all sorts of dumb devices, light bulbs included. The most popular smart light bulb seems to be the Philips Hue, but is a little bit expensive for the average consumer. Some manufacturers even sell their own Wake Up Light Clocks. However, there are Chinese knock-offs that work pretty much the same, connecting to your Wi-Fi network in some way and listening for light commands, for much less dough. One of the cheapest options is the Milight RGBW smart light bulb. It supports all RGB colors along with warm white light. The bulb is dimmable and comes with an official app that lets you seamlessly control it from the comfort of your smartphone. It costs around $10 on AliExpress, and the Wi-Fi box is another $10. Me and my roommate, Ziv, ordered 2 bulbs and the Wi-Fi box, and within a month the package arrived at our local post office. One of the greatest things about this bulb is that it requires no configuration in order to control it -- the Wi-Fi box listens for UDP broadcasts on 255.255.255.255 by default, so there's no need to manually configure a dynamic DHCP-assigned IP address to communicate with it. Also, it screws into the most popular international light bulb socket, which almost every home already has. Once we received the bulbs, it was all a matter of writing some code that will gradually increase the bulb's brightness before the smartphone's alarm clock sounds, so that we'd wake up to a lighted room. And so I built Sunriser. 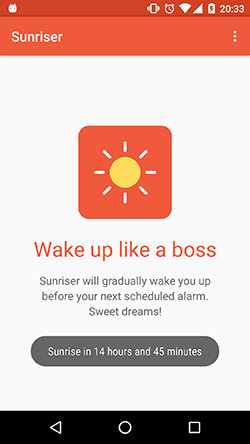 It's an Android app that starts emitting these brightness commands 30 minutes before your scheduled alarm, causing your body to release hormones that will help you wake up easily, feeling refreshed and ready to go. The biggest challenge with this app was to send the right commands to the light bulb. But luckily, all of the commands are documented in some form or another on this page and in various other places on the Internet. It was all a matter of experimentation and reading other people's code to get it working the way we intended. 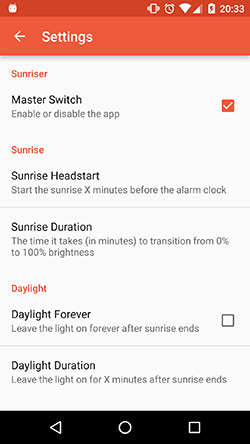 It's also very configurable -- you can set the time it starts emitting the light commands, how fast the brightness should increment, and how long the light should be left on after 100% brightness. We gave it a shot and immediately noticed the difference -- waking up was immediately much easier and we definitely felt an energy boost. One thing's for sure, we'll never go back to waking up in pitch black darkness! Check out the source code, it's open-source and hosted with love on GitHub.